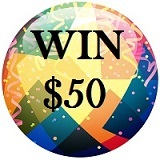 You Could WIN $50 Cash! 1. Write a Summary of the game and use it as your first sentence. 2. Include appropriate Ages for the game. 3. How Many Players would you recommend? 4. Include an Equipment List if applicable. 5. Tell us about any special Set-Up that might happen before the game. 6. Tell everyone How To Play in your own words. 7. Let us know how the Winner is determined. 8. Tell about a Variation to this game if you have one. By following these 8 steps, your chances of winning will increase. Your story will appear on a Web page exactly the way you enter it here, possibly with minor changes as directed by the Sponsor of the contest. IMPORTANT! - Technical difficulties sometimes occur. It would be best if you saved your game instructions in a Word file so in the event that something happens, we can request you re-submit. If you have it saved in your computer, then you won't have to re-write the whole page. Everyone plays games at their kids birthday parties. Why not win a little cash by sharing what games you have played. All appropriate family friendly entires will be posted. Your friends here on Perfect Party Games will love to read about your great ideas, and you will be able to pick up even more great games for the next party you will be planning. This year our Grand Prize for the Contest is $50 (US Dollars). By sending us the instructions and other details of the game you played, you will automatically be entered into the Contest. The more submissions we get, the more prizes we will be adding. You may enter as many times as you like. Or share this contest information with friends and family so we can increase the amount of winners! Only submissions with Complete Instructions and Other Listed Details will be eligible to win. There is no limit on how many Kids Birthday Party Game submissions you make. Each submission will be judged on its own merits. When you write the Kids Birthday Party Game instructions, remember the more info you share, the easier it'll be for others to re-create your game at their own party. Detailed instructions will increase your chances of winning a prize! For instance, give age ranges appropriate for the game, tell us whether or not this is best played in teams, and add your own ideas and other details you used (or wish you had) to make the game even more fun for the players. Photographs are optional and must be your original property or that of a family or friend. Party game instructions must be written in your own words and not copied from any other source.